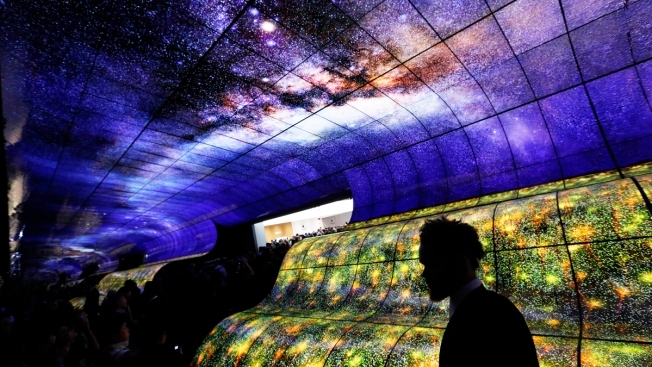 People look at an exhibit of LG OLED TV screens at CES International, Tuesday, Jan. 8, 2019, in Las Vegas. From foldable cellphones to high tech burgers, more than 4,500 companies showcased their latest technology at CES, the world's largest consumer electronics show which took place in Las Vegas earlier this month. Even though tech behemoth Apple does not make an appearance, the trade show gives the public a glimpse at emerging tech trends for 2019 and beyond. One of the most anticipated technologies is 5G – the next generation wireless network that experts say could be as much as ten times faster than broadband. "I see a huge quantum leap from going from 4G to 5G, much bigger than 3G to 4G. And of course, my expectation is that we are going to see so much more innovation," Verizon CEO Hans Vestberg told CNBC recently. Chris Velazco, Engadget's senior mobile editor told CNBC's "On the Money" in an interview that "2019 is going to be the year of 5G, this is going to be the first year people will actually be able to buy devices and jump on the 5G networks," he said. As a result, 5G "will have really big ramifications for the way we use our devices and the way these devices talk to each other," he added. The technology won't be for everyone, however – at least not right away. Meanwhile, Velazo admitted that 5G technology "still feels like it's a lot of talk. We don't have a great sense of how these things pan out in more concrete ways." Yet one technology that did make an impression at CES was foldable screen technology. At the event, LG showcased a 4K OLED TV that rolls up when you don't want to watch it. But it's not just big screens: A Chinese company called Royole showed off its flexible screen technology for a smartphone/table called the FlexPai. This is the world's first commercially available foldable phone, and it beat Samsung and Apple to market. The company is currently taking orders: The cost? A whopping $1,318, even more than an iPhone. However you may want to hold off. Velazco had a chance to check out the device while at CES, and he admitted "they're maybe not the most polished devices." Yet he found the technology compelling. "The ability to fold out and use the phone as a tablet is frankly really powerful," he told CNBC. If you're looking to take a deeper dive into meditation, a Canadian company called Interaxon recently released the Muse 2. The headband goes across your forehead and reads brainwaves in real-time. It then uses auditory cues to provide feedback on the user's meditation state. When it comes to virtual and augmented reality (AR) technology, it usually means wearing large glasses over your eyes, blocking out the world around you. Chinese startup Nreal has plans this year to release their version called Light – which as its name suggests – is a lighter version. "They've been able to take the technology that makes some really impressive AR devices like the Microsoft HoloLens and the Magic Leap and converted it down to this form factor," Velazco told CNBC. But the tech editor admits one of the bigger surprises at CES, based on the level of people that seemed into it, was Gillette's heated razor. And the name really says it all. "It's a heated razor that's meant to sort of replicate the experience of getting a hot towel wet shave at a barber shop." The razor is not in stores yet but according to Engadet's report, it will retail for $160. Another surprising find at CES was burgers. Impossible Foods showed off their latest meatless burger recipe: Impossible Burger 2.0. "The original Impossible Burger used wheat protein and it tasted pretty good, but it kind of didn't give you the same kind of mouth feel that a traditional burger would," Velazco explained. "So they rejiggered the formula. This [latest version] is based on soy protein." He added: "You actually get a bit more of the experience of eating meat, plus I think the flavor has been upgraded as well."